Shorebirds are showing up in the Villas by the dozens and the hundreds. This weekend was the first that we saw large numbers of Sanderlings joining the Dunlins who hung around all winter. 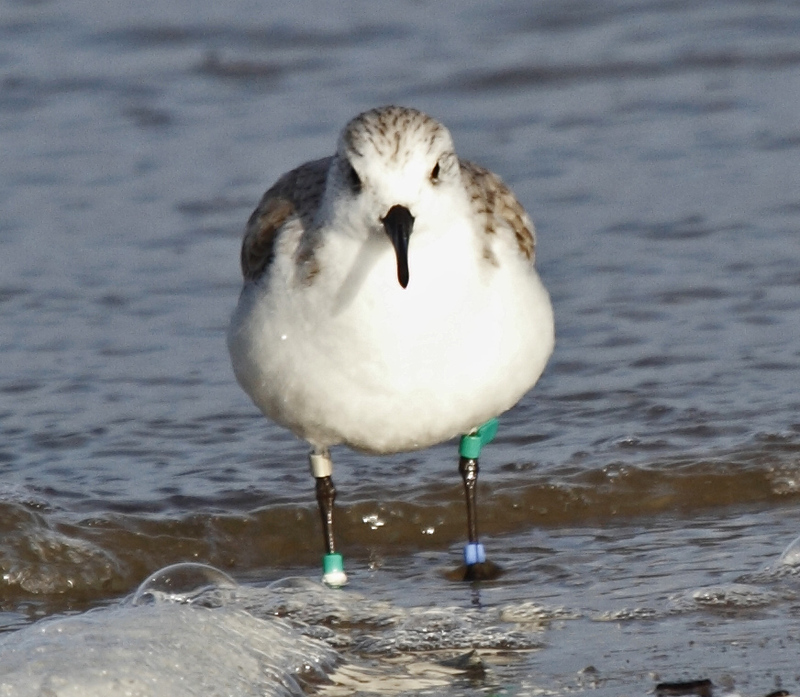 Scanning the flock revealed one Sanderling who stood out from the rest due to the green flag on his leg. I got close enough to the bird to get a few photos and then realized that the bird had more bling than just one flag. This bird had a green flag, a metal band, a blue band, and a green and white band. That's more bling than Liz Taylor. Check out all of the hardware this bird has to lug around. I reported this to BirdBanders.org . We'll see if they send me any information on the bird's travels. This is a great website that explains the bands and how to report resightings. Any information is used by scientists. Here he is with a few "friends". 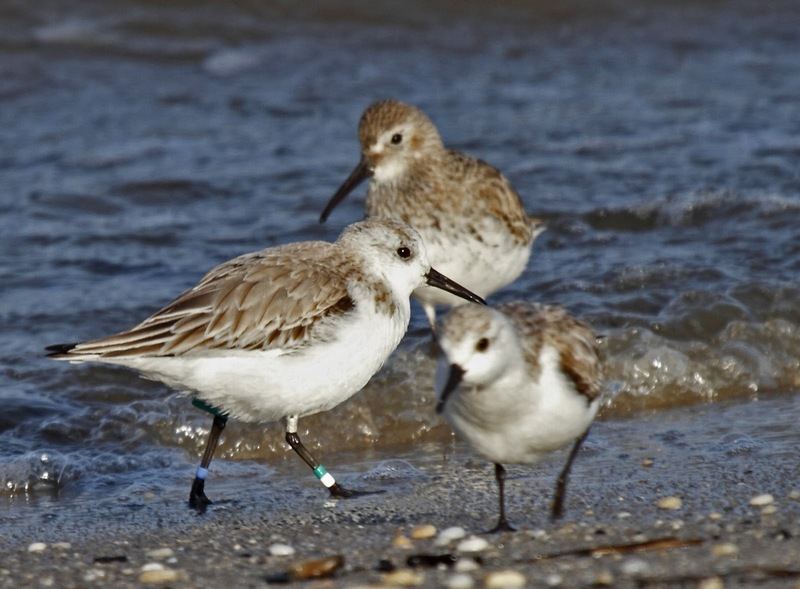 Of course, birds don't have friends but shorebirds certainly like to hang around together for protection. The Sanderling is the one with the "jewelry" facing left. The bird in the water is a Dunlin. Notice he has a longer bill that droops slightly. The bird running toward the camera might be a Semi-palmated Sandpiper, but I am unsure. 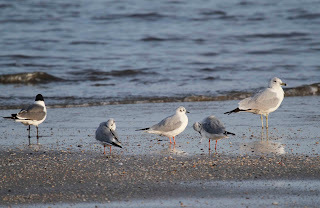 Bonaparte's gulls will soon be Bona-depart's gulls (get it?) when they leave us to head north. 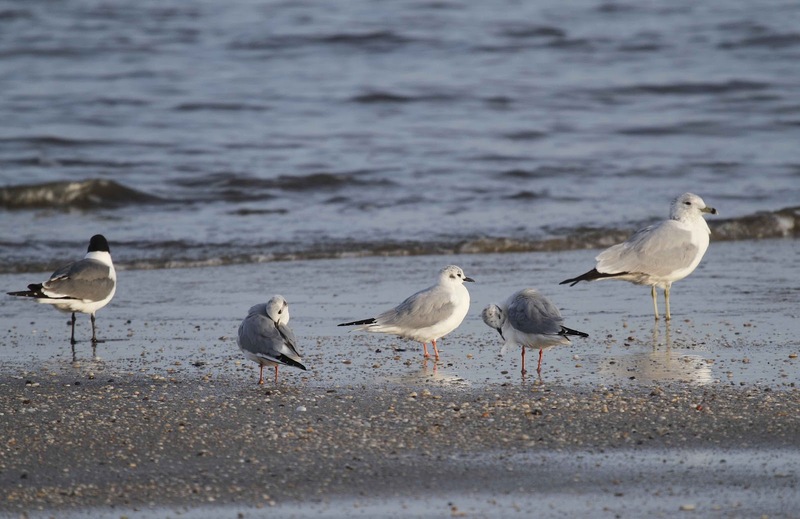 These are dainty gulls that keep me smiling in winter until the Laughing gulls return from Florida. Next post from California - hopefully. I wonder what makes Liberace (yes, I just named him) so "taggable". Is he the unfortunate (dumb) bird who keeps getting netted, and therefore banded? Or maybe he's a friendly kind of guy who likes being handled and oooh'd and ahhhh'd over during the banding process.